90 degrees of beautiful mountains views from the deck ! Welcome! to this beautiful rustic cabin sits on 40 acres of land. Located 30 miles south of Fort Carson and 30 miles west from Pueblo and 10 miles from cañon city making for an easy commute to town. closely locate to many attractions such as Rock climbing , scenic views /hiking trails , white water rafting , horseback riding , zip lining , parachute,fishing ,jeep tours and so much. 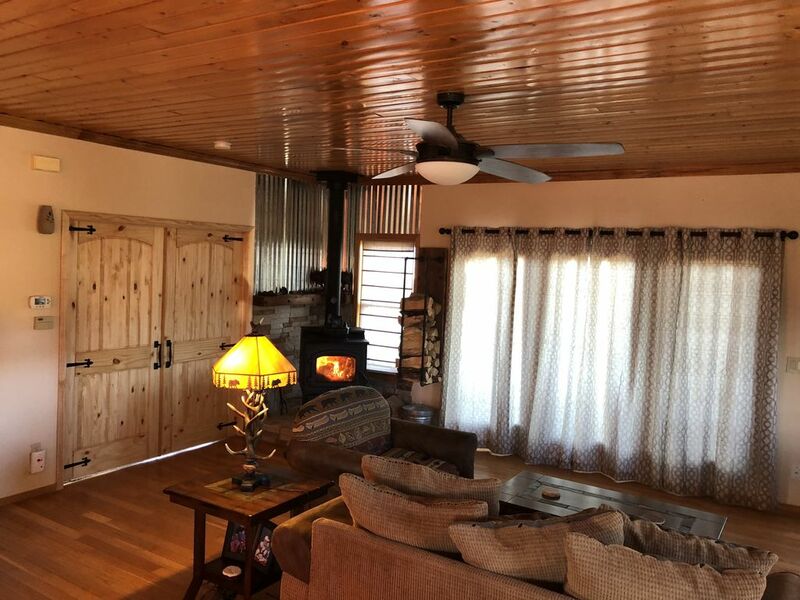 start your vacation by booking this beautiful cabin today ! !WARNING! for winter you will need a 4x4 ,all wheel drive, truck etc it doesn't get much snow every year but be prepare !!!! This is an awesome cabin in the country. The deck faces the sunset over the mountains. We were driving to different attractions during the day and coming home to this beautiful cabin at night. Fully furnished everything, even kitchen. Quiet, peaceful, scenic, clean, spacious. I’d go back tomorrow if I could. If you are looking for a nice place out of town, this is it. Small cars might have trouble on the drive way. We enjoyed this property and it was perfect for a multiple family trip. The house and property are so nice and so are the owners. Would use them again if we come back to Colorado! We thoroughly enjoyed the comfort, quiet and beauty! Ricco and Maria welcomed us and we settled in for a wonderful 3 days. We hope to return soon! Very clean and well kept, easy to get to yet off the beaten path. Away from city beaten path mean deep in the wood close to nature !! !get a 4x4 !!!! Cozy Cabin & Gorgeous Views! We couldn't of been more happy with our stay at Rock Ridge Ranch! Ricardo & his wife were incredibly hospitable and made sure we enjoyed our stay; not only with the cabin but also with numerous suggestions on places to go and things to do around town. I couldn't of picked a better place that felt like home and had the best views for our trip to Colorado. Thank you for allowing us to enjoy your place during our stay Ricardo! We can't wait to make a trip back! !